Family, friends, and music fans packed Salter Hall Saturday night for a Family Day Concert that Professor and Music Department Chair Larry Bennett called "one of the best student concerts we've had in recent years- especially for this early in the year." "The level of singing and playing has really risen," Bennett said of the performances by Wamidan, the College's world music ensemble; the Jazz Improv Combo; and the Wabash Glee Club (view a photo album from Saturday's concert) Most surprising, though, were solo piano works, as well as Fritz Kreisler's arrangement of Manuel de Falla's Danse Espagnole, played to the audience's delight by violinist Adam Dybel '07. "We have an especially talented freshman class," Bennett said, commenting on the piano performance by Kyle Prifogle '09. Prifogle and sophomore Christopher Geggie '08 played works by Spanish composers that brought rousing applause from the standing room only crowd at Salter. Wamidan's drum and dance groups have become crowd favorites, but most original composition honors went to percussionist Syud Ahmed '07 and Crawfordsville High School junior Grey Castro's blending of Asian tabla drum and Australian didgeridoo. Junior Desmond Risper on tenor sax led a stirring set by the Jazz Improv Combo, playing numbers by Wayne Shorter, Duke Ellington, and Charlie Parker, accompanied by sharp piano riffs by George Colakovic '06 and guitarist Haris Amin '08, bass player Tyler Carr '06, and freshman drumming standout Miguel Munoz. 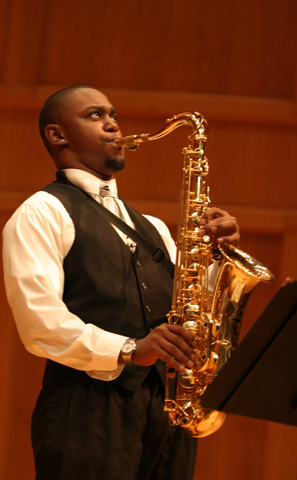 "The Jazz Improv Combo will no doubt be asked to perform in Indianapolis," Bennett said. "George and Desmond have really grown musically. "I think this concert didn't come out of the blue," Bennett noted. 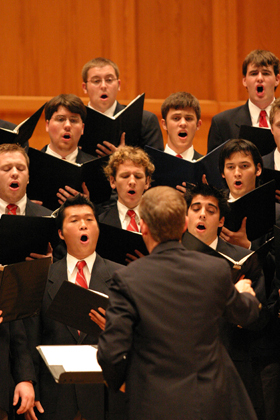 "Last year's Spotlight Concert and final student recitals were also on a high level. It bodes well for the future." Members of the Jazz Improv Combo will perform with the College's Jazz Band at the Jazz Band/Brass Ensemble concert on Tuesday night at 8 p.m. in Salter Hall.